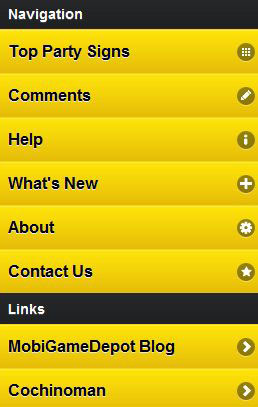 At the top of the main screen, you will see a text entry box and 2 buttons and an emoticon selection button. Enter the message you want to scroll in the text entry box. Then click on "Show" to display the message. Touch the screen to return to this main screen. After viewing, if you would like to share this message with others, click on the "Share" button and a link will be shown to you. Now, copy and paste the link shown to an email or text message. When they click on that link, they will be shown the same scrolling message that you created. Please note that the link can be used by anyone. Therefore, do not share message containing personal information that you do not want to share with others. Touch the emoticon icon to bring up a list of all the available emoticons. Touch any of the emoticons to enter the code into the text entry area automatically. Touch the emoticon icon or anywhere outside to close the emoticon list. Next, you can change the text color or background color. 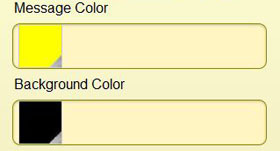 To change the color, touch the color swatch. 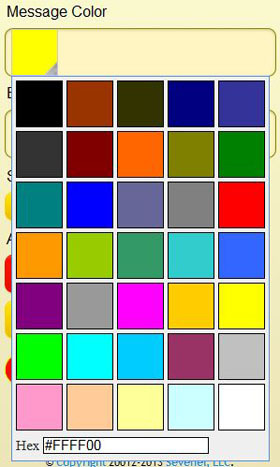 A color pallete will open allowing you to pick the color you want. If you are technically inclined, you can even type in the HEX code of the color you want located at the bottom of the pallete. Below that area, you can select the scroll speed to slow, medium or fast. Medium speed is the default. If you select "None", the message will be static and not scroll on the screen. You should use this for very short messages that fit on the screen without requiring any scrolling. 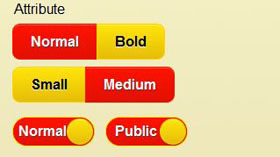 The bottom area sets the attributes for the font. You can set the font type to "Bold" or show a smaller size. The default is normal font at medium size. You can also mirror the message by sliding the "Normal" to "Mirror". This is useful if you want the reader to read the message in a mirror like their rear view mirror. Lastly, the "Public" slider sets the message as a public message that will be listed in the "Top Party Sign" list. 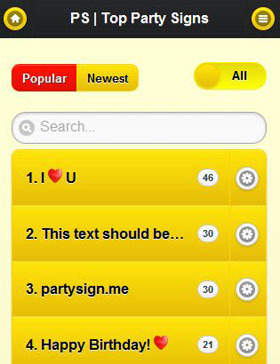 This list shows the most popular messages that people have viewed on the website. If you do NOT want your message to be on this list, set this slider to "Private". Note that turing on the setting to private does not mean that your message cannot be seen. Anybody with the link from the "Share" option described above, can view your message. This setting simply precludes it from being listed in the "Top Party Sign" list. Therefore, do not share personal information in your messages. At the top of every page, you will see a header with 3 small icon buttons. The button on the left will bring you home to the main screen where you can create a new message sign. The button with the lock will allow you to login to your account if you have one. If you don't have an account, you can create one my touching "Sign up for FREE" at the bottom. 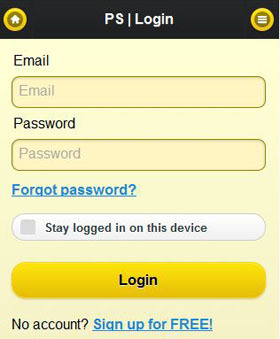 If you already have an account, to login, simply enter your email address and password. If you cannot remember your password, touch "Forgot password" and your will receive an email with a link to reset your password. If you would like to remain logged in, touch the box next to "Stay logged in" and you will not have to login when you return for 30 days. If you are looking at this help message, it's very likely that you figured out that the button on the right brings up a navigational menu. This menu will allow you to go to all the areas that are available on this website. One of the options in this list is the "Top Party Signs" screen. Select "Popular" to see a list of the most viewed signs. Select "Newest" to see a list of the most recently created signs. Select the switch at the upper right to either "All" or "Mine". "All" shows signs created by everyone. "Mine" will only show signs created by you. To find a specific sign, type in the box labeled "Search" to only see matching signs. Q: Sometimes the scrolling is slow or jittery. What can I do? A: This indicates that your smartphone's browser is running out of memory. You can close and re-open your browser or if that doesn't work, you may have to re-boot your smartphone. Please refer to your smartphone manual for instructions on how to re-boot your phone. Q: What's different in the new version? A: Touch the natviation button at the upper right corner, then touch "What's New". A: First, logout by going to the navigation menu. Next, touch the login icon. Next, touch "Forgot password" and you will receive an email with a link to reset your password. Q: When are you going to add more emoticons? A: Please send us some suggestions by posting a comment. If you still have more questions, please feel free to contact us.